Winters can be pretty painful to some. To others, it’s time to fire up the snowmobile, cruise the trails and hit some sweet jumps. But it’s not all fun in the snow. There’s a lot of risk. And if your protection plan only consists of a helmet and a fluorescent jacket, you could be in for an avalanche of trouble. Finding top coverage for your snowmobile is a trip no rider should go alone. Our independent insurance agents will be there to guide you through a handpicked selection of options to make sure you and your machine are properly protected. It depends on where you live. 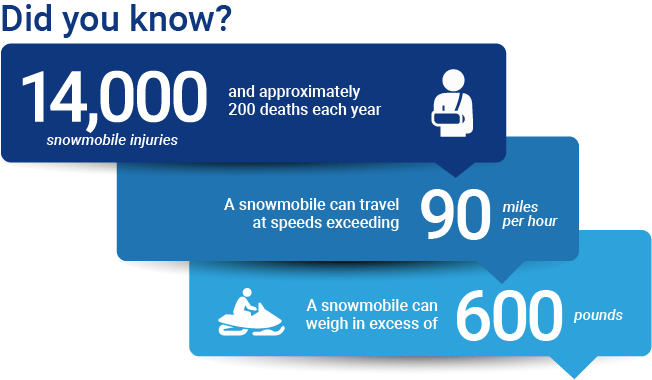 Around half of US states currently require snowmobile insurance. If you don’t have it and get in an accident that causes damage or injury, you’ll have to tackle medical expenses, legal fees and repairs out of pocket. How comfortable are you with that? Your snowmobile insurance policy should be a direct reflection of how you use it. It’s important to talk to your independent insurance agent so they can customize your policy. That being said, a basic snowmobile insurance policy will typically include coverage for bodily injury and property damage liability. Uninsured/underinsured motorist coverage: This coverage protects you if another snowmobiler causes an accident and lacks the proper insurance to cover your costs. Accessories coverage: This option can provide compensation for damages to other items closely related to your snowmobile, like your trailer, and can even protect you if someone steals your helmets or other safety equipment. Comprehensive coverage: Comprehensive covers you for "other than collision" damages, which may include damage from storms, theft or vandalism. Roadside assistance: If you find yourself stranded with a dead battery, lost keys, empty gas tank or any other reason, you can call for help and get a lift to the nearest repair facility, at no cost to you. Note: If you have a policy and decide to take your sled across state lines, your coverage will keep you protected, regardless of their laws. This will depend on the coverage and a handful of other factors that can affect the cost of your policy. But even the most comprehensive policies tend to be fairly inexpensive. On average, your sled insurance will only cost you about $10-$20 a month. That’s a pretty small price to pay for the heaping pile of peace of mind you’ll have knowing you are financially protected on the trails. Everybody knows saving a buck or two is the real national pastime—that’s just a fact. Well, you can often get insurance discounts when you combine your snowmobile insurance policy with existing policies, like homeowners, auto and umbrella. Plus, combining your insurance policies under one agency will also help make sure you’re covered properly and make handling any claims much easier. You like easy, right? Our independent insurance agents will review your needs and help you evaluate the snowmobile coverage that makes the most sense. They’ll also compare insurance policies and quotes from multiple carriers to make sure you have the right protection in place. Why Go with an Independent Insurance Agent? Independent agents will walk you through a handpicked selection of policies from all the top snowmobile insurance carriers. Not only that, they’ll cut the jargon and clarify the fine print, so you know exactly what you’re getting. Most importantly, they’ll be there to help you file a claim. The outcome of insurance claims can be strongly impacted by how the process is approached and handled.